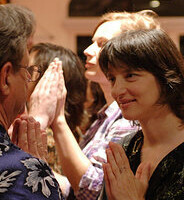 We have planned a night of sacred love, light, healing, fulfillment and fun just for you. You do not have to be in a perfectly happy space to join us. We welcome you to come as you are and invite you to have an intention to be present and allow your heart to open! 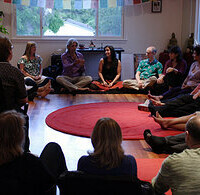 Group Tantra Classes are offered periodically and are available for both singles and couples. These classes honor the great diversity and spectrum of Sexual Orientations. All are welcome. We will explore the history of Tantra, as well as modern expressions of these ideals for our time and culture. We will also explore how today’s “Sacred Sexuality” relates to traditional Tantra. Tantric practices guide you to be completely present, opening your heart to a deeper connection with yourself and others. You deepen awareness and understanding of your own feelings, and discover how to feel safe to show your emotions. You also become aware of where emotions are in your body and how to move, amplify or release them. Throughout our workshop / puja / ceremony there will be multiple activities designed to help create a greater connection and harmonic relationship to your own mind – body – spirit as well. Sexual expression is an innate part of who we are as spiritual beings in this world. Let us create balance for the masculine and feminine aspects of ourselves and learn that making love starts within. These gathering strive to help individuals and couples to become more open and at ease while relating with each other as we explore practices for enhancing pleasure and transmuting sexual energy. There are exercises that are appropriate for singles, couples, and even people who are just meeting for the first time. In this space we learn together how to become more confident, and intuitive lovers. This is a great way to deepen your capacity for intimacy on all levels, both in and out of the bedroom. Arrive about a half hour early and register at the door. Mingling and quiet conversation are welcome at this time. Bring the exact amount in cash if you can. Credit cards are okay, but take a little longer – so please be patient. If you have prepaid 24 hours before the event we will have your name on the list at the door. This makes the check in experience faster. After signing in, we welcome you to take a deep breath and come through the door. Know that you are entering into a sacred space with the energy of love welcoming you. Let go of your day as best as you are able and enter into a comfortable, warm, gently lit room, with soothing meditative music.